mrbrown made the acute observation that most screens in Singapore are only offering 4 movies throughout this CNY festive season – Ah Long Pte Ltd, CJ7, Kung Fu Dunk and Sweeney Todd: The Demon Barber of Fleet Street. The sad observation I have made is that, amongst GV screens at least, there seems to be a certain belittling of the King of Chinese Comedy in terms of box office draws and people pull, by said movie distributorship organisation. And this is in spite of the fact that Stephen Chow movies have been affirmed box office hits throughout the years. What, so they think Stephen Chow and Jack Neo cannot hold their ground against Jay Chou, who incidentally is more renowned for his music than his movies? As opposed to the former two who have made the movie industry his bread and butter throughout the years? 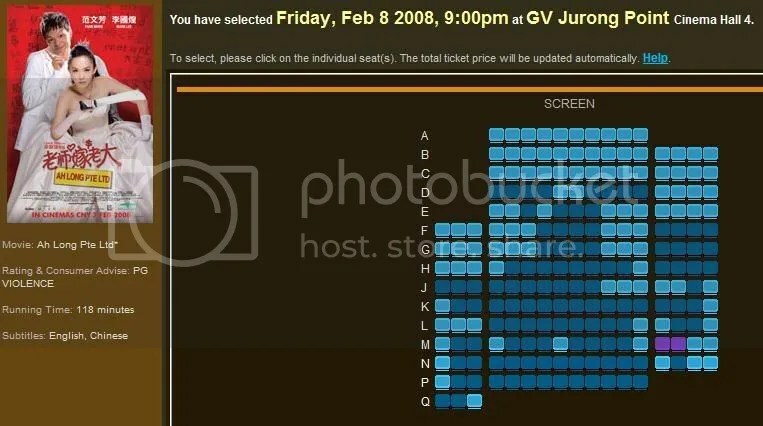 It has now become apparent that, through some close monitoring of their seats availability page (as I intend to catch a movie or two), seats in halls for Stephen Chow’s CJ7 and Jack Neo’s Ah Long Pte Ltd are ‘selling fast’ or ‘sold out’ despite it being so early in the day and the movies only being shown at night. Why then, do they not cater bigger halls for these movies, since movies by these directors have been confirmed box office draws in the past? Of course detractors are bound to argue that in economical terms, more timeslots and bigger halls will eventually lead to a more even distribution of audiences for Jay Chou’s movie. On the other hand, why let this happen in the first place? Why not ensure a more even distribution of audiences for the other two movies as well?